In Saturday’s News Fix, our Senior Managing Editor, Vin Narayanan, mentioned that bitcoin mining activity has increased. So despite bitcoin’s falling price, miners are still able to churn out profits. This week’s chart helps illustrate that point. Even as the price of bitcoin dropped this year from record highs, the rate of bitcoin mining increased. Anyone can become a bitcoin miner with the right hardware and software. But the equipment needed has evolved over time: from PC to GPU (graphics processing unit) to FPGA (field-programmable gate array) to the current ASIC (application-specific integrated circuit). As Vin pointed out, large mining firms have invested in high-quality hardware from companies like NVIDIA. The powerful chips have improved miners’ efficiency (and boosted NVIDIA’s business). These days, NVIDIA is seeing a decline in the sale of chips to miners. And semiconductor companies are seeing a drop-off from mining customers. That indicates miners have enough hardware to handle the current demand. While profit margins are lower than what miners would like right now, bitcoin miners seem to be focused on the long game. David Sapper, chief operating officer at cryptocurrency exchange Blockbid in Melbourne, says miners are still moving forward. 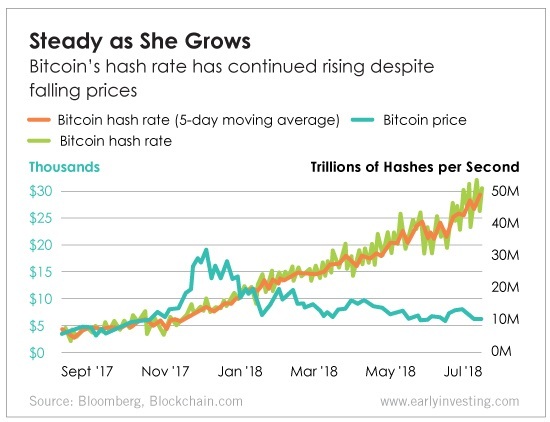 “The increased hash rate means people are here for the long term,” Sapper says.